Contents. List of Contributors. Preface (A.G. Lee). Molecules of Cell Adhesion and Recognition an Overview (R. Marsh and R. Brackenbury). Cell Recognition Molecules of the Immunoglobulin Superfamily in the Nervous System (G. Gegelashvili and E. Bock). The T Cell Receptor (C. Horgan and J.D. Fraser). The Major Presentation and Histocompatibility Complex (J. Colombani). Cadherins: A REview of Structure and Function (J. Wallis, R. Moore, P. Smith, and F.S. Walsh). The Integrin Family (R.D. Bowditch and R.J. Faull). The Selectin Family (M.A. Jutila). The CD44 Family of Cell Adhesion Molecules Functional Aspects (C.B. Underhill). Membrane Associated Mucins (H.L. Vos, J. Wesseling and J. Hilkens). Platelet Membrane Glycoproteins (K.J. Clemetson). Immunologlobulin Fc Receptors: Diversity, Structure, and Function (P.M. Hogarth and M.D. Hulett) Index. 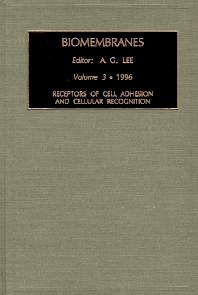 Volume 3 of Biomembranes covers receptors of cell adhesion and cellular recognition. Proteins in the plasma membrane of cells are heavily involved in processes of cell adhesion, but such proteins were not actually isolated and characterized until the mid-1970s. Since then, application of the methods of molecular biology has led to the recognition of four major classes of cell adhesion molecule (CAMs), the immunoglobulin super family, the cadherins, the integrins, and the selecting. A convenient system in which to study the importance of cell adhesion is in blood platelets where aggregation eventually leads to thrombus formation in a process involving a range of surface glycoproteins. Interaction with the extracellular matrix is exemplified by CD44, the receptor for hyaluronan, and a complex carbohydrate that is a major component of the extracellular matrix surrounding migrating and proliferating cells. Membrane-associated mucins have a variety of effects on cell adhesion. The super family of immunoglobulin related proteins also include the T cell receptors and the major histocompatibility complex (MHC), which, together with the receptors for immunoglobulins (the Fc receptors), are of fundamental importance in the processes of immunity. Volume 3 of Biomembranes explores the structures and functions of the molecules involved in these important functions of the cell.